Nulls. Seems like they are the universal headache among all data based projects. 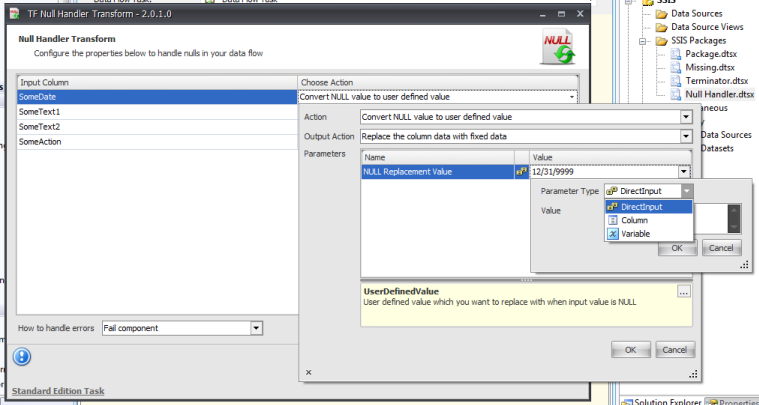 Trying to clean up nulls in SSIS is certainly doable, but not without some work with expressions. An equal headache to null values are blank values. In most cases, you’ll either want these converted to a null, or some specific value. Because null handling is such a common task Task Factory has a transformation specifically designed for working with nulls, the Task Factory Null Handler. There are three options for handling nulls / blanks within the Null Handler. Let’s take a look and see just how it works. First, we’ll need some sample data to play with. Here’s a small script I created to do just that. It’s only a few rows, enough to test the various modes Null Transform supports. In the first row, we’ll be converting a null date to a defined value, specifically the date 9999-12-31. In the second row, we’ll convert a null text field to a user defined value, "Was Null”. In the third row, we’ll convert blank text to user defined text. In the final row, we’ll convert a blank to a null. Now that we have our data in place, it’s time to setup the SSIS package. Create a new package and drop a data flow task on it. Start with a standard OLEDB source, and hook it to the database and NullTestSource table. Next, drag the Task Factory Null Handler on the display surface, and hook it to the source. When you open it, you’ll see a list of the input columns, to the right they will all be set to ‘No Action”. Expand the drop down for the action beside the SomeDate column. Change the action to “Convert NULL value to user defined value”. Now click the drop down beside the value. In the Parameter Type drop down are three options, Direct Input, Column, and Variable. These are the various choices you have for providing a replacement value. For this exercise, we’ll just use the Direct Input. Change the replacement value to 12/31/9999. Repeat the steps for SomeText1, only for it’s replacement value use “Was Null”. For SomeText2, select “Convert blank to null” for the action. No other configuration is required for this action. Just leave the SomeAction column set to “No Action”. It’s merely present to tell us what action the row is performing. Well, this looks pretty good, but it’s not quite right. For the SomeText1 column, we wanted to check for two conditions, first if it’s null we wanted it converted to a value, second if it was blank we wanted it converted to a different value. In the first null transform we handled the conversion of null to a specific value, but now how to also check for a blank in the column and replace it? No problem, all we need to do is insert a second Null Transform between the first one and the Terminator destination. Inside it, beside the SomeText1, select the action “Convert blank value to a user defined value”. For the user defined value, enter “Was Blank”. Now hook it to the destination, and place a data viewer on it. Now we should see the correct results. There we go. The Null Transform makes dealing with blank and null values very easy and straightforward.